The old standby product "Fungus Cure" has been discontinued. We have been using and testing API Medications professionally for years only selling the products from API that we know work best. Why purchase anywhere else to save a couple dimes when here at AAP you will get the CORRECT information AND the product still at a low price? 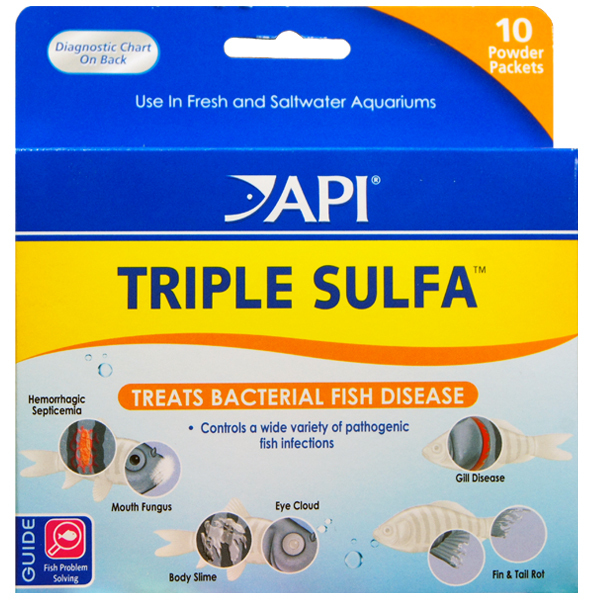 *Rapidly treats fungal infections on body and fins. *Shown to be effective for the treatment of Flexbacter (columnaris). 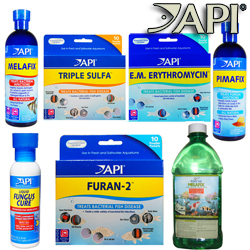 *Safe for delicate fresh and saltwater fish. *Rapidly repairs damaged fins, ulcers, and open wounds. 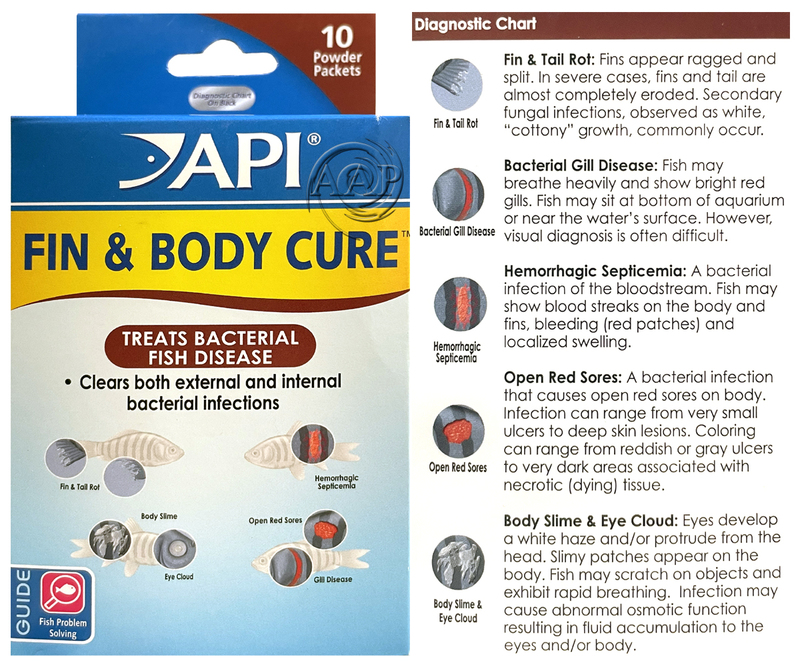 *Promotes re-growth of damaged tissue and fins. * Barley Clear is a highly concentrated suspension of natural barley and peat plus natural activators. * Barley Clear is also helps maintain the natural carbon balance, which stabilizes water quality and maintains clear water. * The natural properties of peat contained in Barley Clear buffer the pH for a more stable pond environment. *TURN OFF UV Sterilizers for 12 to 24 hours after adding this product. * Specially selected bacterial strains in AAP/API® Pond-Zyme Sludge Destroyer immediately begin breaking down fish waste and dead algae that cause cloudy water, sludge build-up, and debris that clogs pumps and filters. 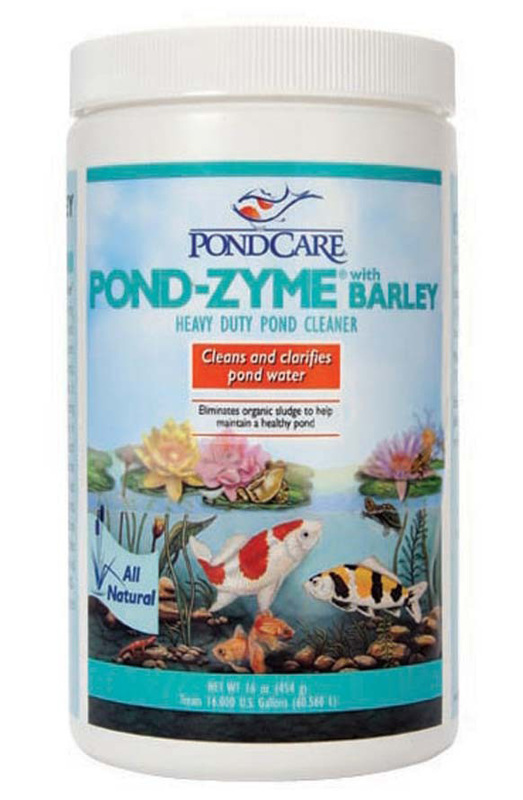 Through enzymatic action, Pond-Zyme Sludge Destroyer reduces pond maintenance and keeps pond water clean and clear. 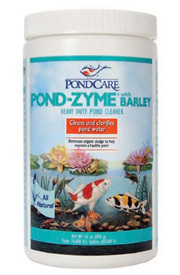 * Pond-Zyme Sludge Destroyer is a 100% natural product, & safe for all pond fish, plants, and wildlife. Initial dose at Spring start-up and end of season dose: add two scoops per 200 gallons of pond water twice a week for 2 weeks. Maintenance dose: add one scoop per 200 gallons every 2 weeks. 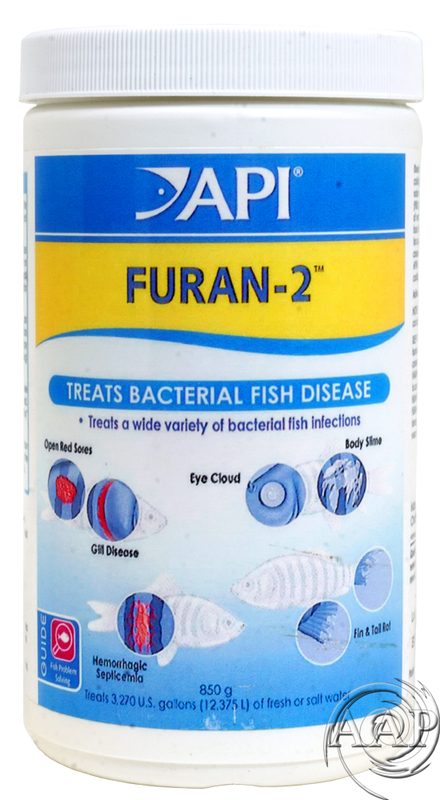 * Effective against a wide variety of gram-positive and gram negative bacterial diseases of aquarium fish, including; Furunculosis (Aeromonas), Dropsy, Gill Disease, Fin and Tail Rot, Hemorrhagic Septicemia, Eye Cloud, Black Molly Disease. *Can be combined with Kanaplex to make an even more wide spectrum treatment, especially for Columnaris or difficult cases of Aeromonas. This combination is similar to the AAP product “Spectrogram” (although not quite as synergistically effective). *Can also be combined with Kanaplex & Metronidazole for parasitic, fungal, & bacterial infections; this duplicates the popular AAP/Aquatronics product “Paragon 2” that is currently not available. 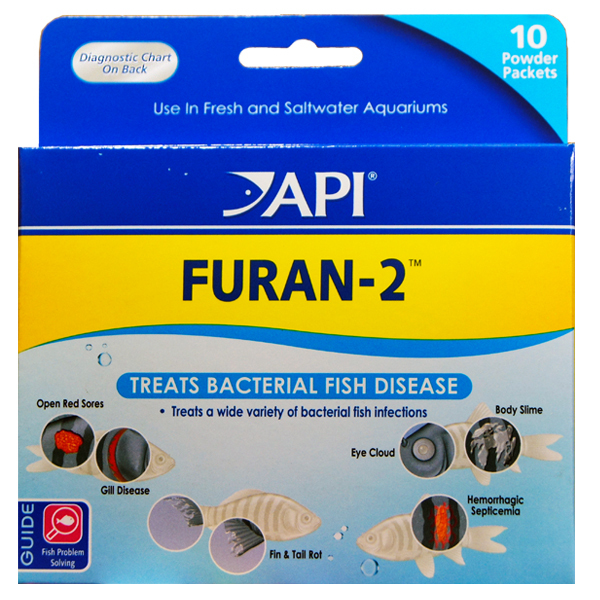 *Another useful combination treatment for un-diagnosable fish diseases and fish die-offs is the use of Furan 2 at full strength along with the Medicated Wonder Shell. 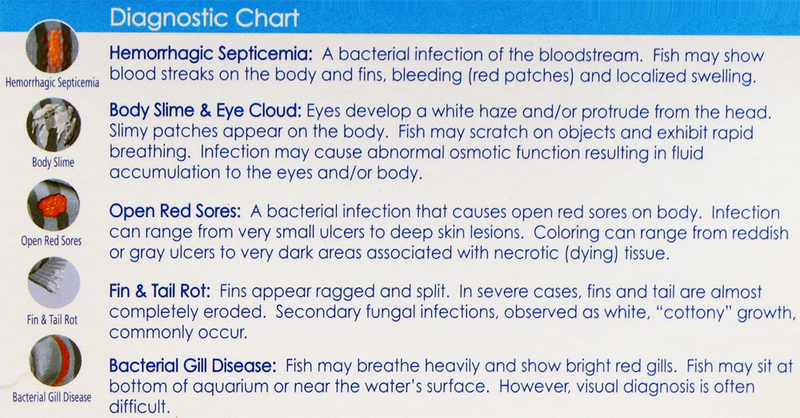 The Medicated Wonder Shell also has other wide spectrum ingredients for many external parasitic, some internal parasitic, fungal/Saprolegnia and some bacterial problems. 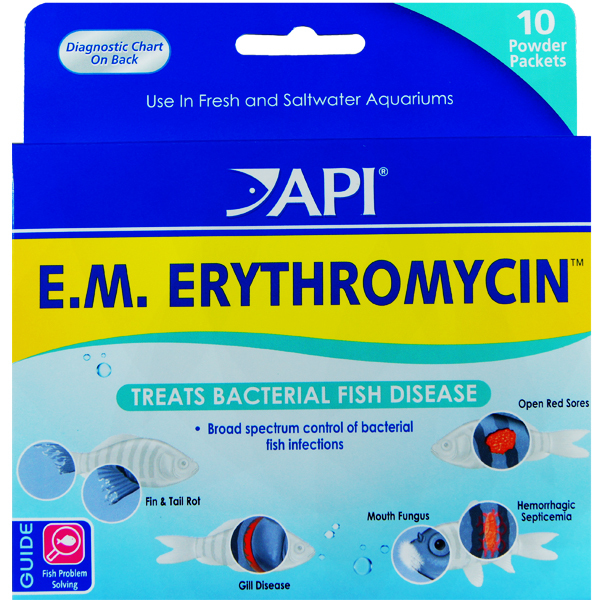 As well the product adds essential mineral Cations that ALL fish need for osmoregulation and improved fish immunity. *USE: Remove carbon, Purigen, etc., Treat one packet per 10 gallons net water. Treat again in 24 hours. After another 24 hours change 25% of the water and treat once again followed by another treatment 24 hours later again. A total of FOUR treatments followed at the end with another 25% water change. If used with Kanaplex (Kanamycin), treat as previously directed while treating Kanaplex ever 48 hours for 3 doses. *Directions for Bulk Use: For each 20 gallons (75 L) of water add 1 scoop (1 tsp.). For larger systems, for each 240 gallons (908 L) of water add 12 scoops (4 Tbsp. ), or for each 960 gallons (3,634 L) of water add one cup. Repeat dose after 24 hours. Repeat this treatment a second time for a total of 4 treatments. Wait another 24 hours then change 25% of the aquarium water and add AAP BIO-CHEM ZORB or fresh activated carbon. *Directions; Remove activated carbon and add packet per 10 US gallons repeat dose after 24 hours. Wait another 24 hours and then change 25% of water. Repeat this treatment for a second time for a total of four doses. Then after 48 hours change 25% of water and replace carbon or similar. 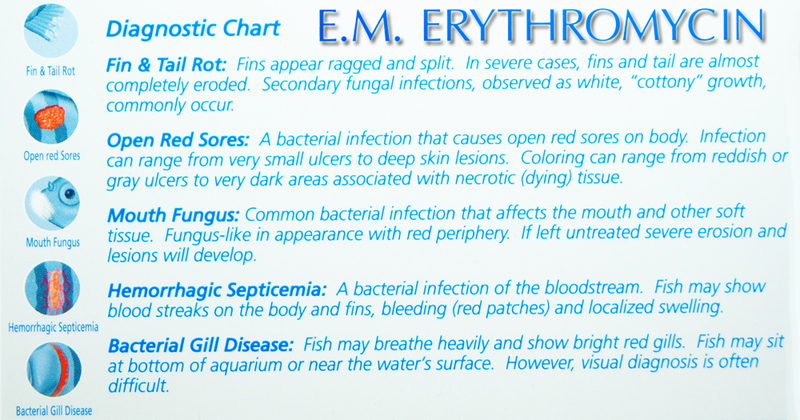 *Alternative treatment for Erythromycin, especially for Streptococcus infections in fish (not to be combined with Erythromycin). 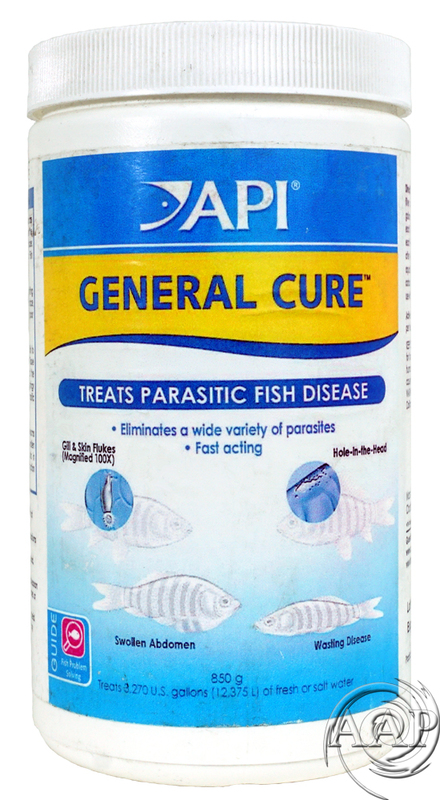 *Effective for SOME causes of diseases such as bacterial tail rot, cotton mouth fungus and gill disease. *Primarily gram positive, however Tetracycline has some wide spectrum gram negative use as well. 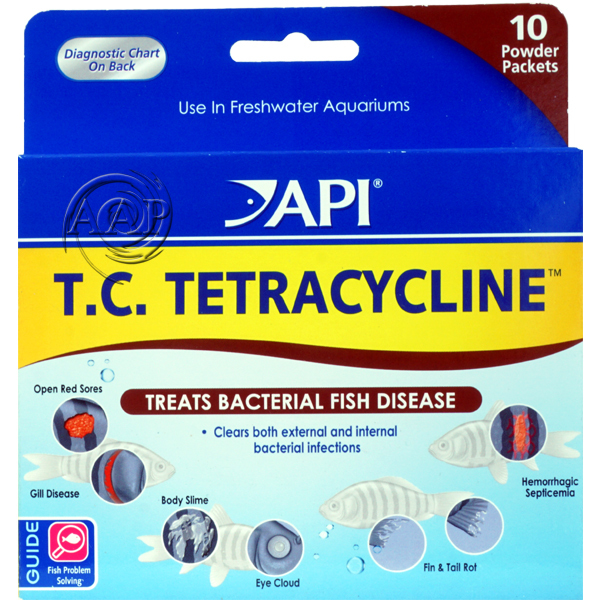 *Tetracycline will cause a slight brown discoloration & foam of water which can be removed with activated carbon. 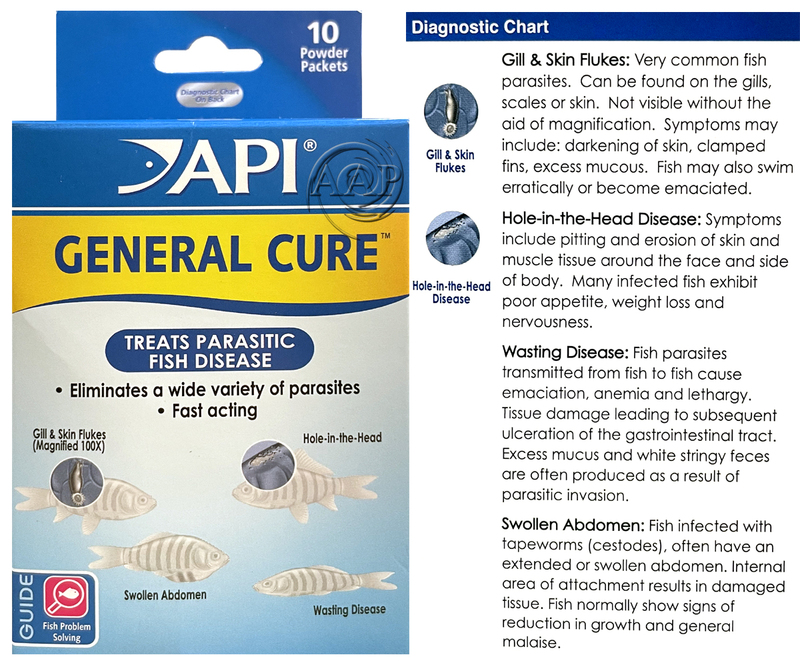 General Cure can be used as a medicated fish food soak by using 1/2 a packet for an average 60 gallon bio load medicated fish preparation. Fish food should be soaked for 15 minutes. *Directions for Bulk Use: For each 20 gallons (75 L) of water add 1 scoop (1 tsp.). For larger systems, for each 240 gallons (908 L) of water add 12 scoops (4 Tbsp. ), or for each 960 gallons (3,634 L) of water add one cup. Repeat dose after 48 hours. Wait another 48 hours then change 25% of the aquarium water and add AAP BIO-CHEM ZORB or fresh activated carbon. *Directions; Remove activated carbon and add packet per 10 US gallons repeat dose after 24 hours. Wait another 24 hours and then change 25% of water. Repeat this treatment for a second time for a total of four doses. Then after 48 hours change 25% of water and replace carbon or similar. The Pimenta extract composition and treatment of this invention are effective for a broad range of bacterial and fungal diseases that typically afflict fish and other aquatic animals. 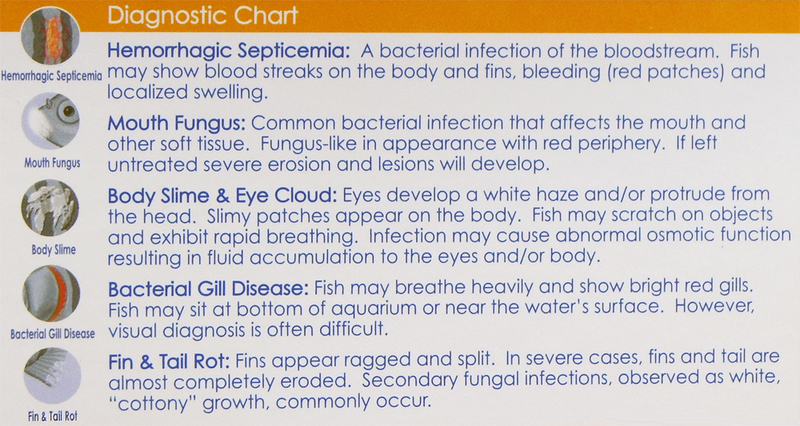 Fish diseases that may be treated in accordance with this invention include bacterial fish diseases, such as fin and tail rot, mouth fungus (often caused by the bacterium Flavobacterium columnaris); fungal fish diseases (such as those caused by microorganisms of the genera Saprolegnia and Achyle) and the like. 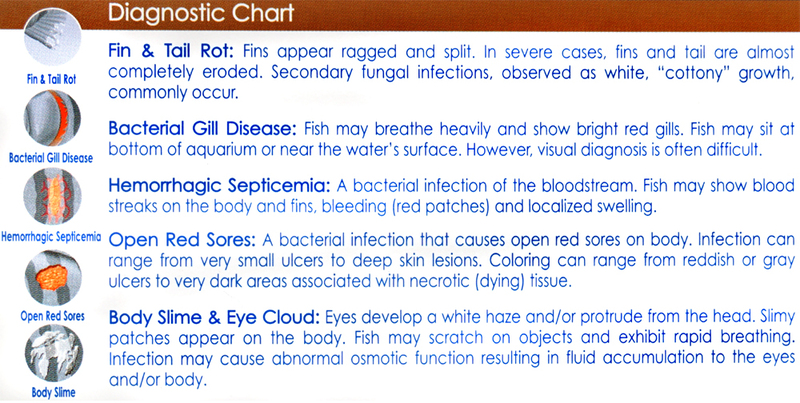 Many fish diseases, it should be noted, are caused by different bacterial or fungal pathogens that often exhibit similar symptoms, so identification of a specific bacterial or fungal pathogen is not usually possible from mere visual inspection of the symptoms on the fish. Since the Pimenta extract treatment of this invention appears to have broad-spectrum effectiveness against many diseases affecting fish and other aquatic animals, precise identification of specific bacterial or fungal pathogens causing the disease is not usually necessary. The Pimenta extract composition and treatment of this invention also enhance skin and tissue healing and promote such healing in injured fish or other aquatic animals. 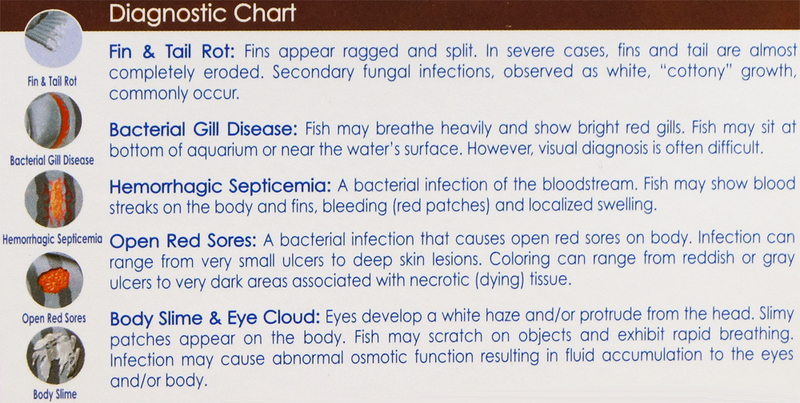 Common fish injuries include those resulting from netting, handling or confinement in closed or crowded environments, like shipping containers or holding tanks, in particular, injuries, such as wounds, lacerations, bites from other fish or animals, abrasions, scrapes, bums and other similar damage to skin or other tissues. The Pimenta extract treatment and composition of this invention are remarkably effective in curing such difficult-to-treat fish diseases, like ragged fins and bacterial dropsy (early stages). The Pimenta extract composition and treatment method of this invention may also be used as a prophylactic or hygienic treatment, to prevent disease-susceptible fish or other aquatic animals from becoming afflicted, or for immediately treating injury-susceptible fish or other aquatic animals when they become injured. As with all medicaments, continuous long-term treatment is not generally recommended, since it creates the risk of developing resistant strains of pathogenic microorganisms that may not be able to be successfully controlled with the medicament. If you have a UV Sterilizer/Clarifier for aquarium disease prevention, changing your UV Lamp once every six months is suggested for optimum performance.